SOCA said it hoped the move would make it harder for criminals to move and launder money. London, England (CNN) -- The 500-euro note is no longer available in Britain after evidence showed it was used mostly by criminals, British authorities said Thursday. The note has not been criminalized, but the move means it will no longer be available from banks or money service bureaus, the Serious Organized Crime Agency (SOCA) said. People will still be able to deposit 500-euro notes into British bank accounts if they bring the notes back from abroad, SOCA said. The amount of 500 euros is equivalent to about $628. "There is no doubt that the main UK demand for the 500-euro note comes from serious organized criminals," said the agency's deputy director, Ian Cruxton. "The banknote wholesalers have shown decisive leadership in withdrawing supply. This is a bold and welcome move which will cause substantial disruption to criminals' ability to move and launder large quantities of cash." Criminals have historically moved cash out of the country by exchanging high-denomination notes for lower denominations, which are harder to detect, regardless of the currency, SOCA said. An analysis by the agency, however, showed that more than 90 percent of British demand for the 500-euro note came from criminals. 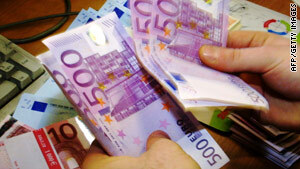 "Today's announcement means that accessing 500-euro notes will be much more difficult," SOCA said. "Anyone trying to source them will attract attention." SOCA said it hoped the move would make it harder for criminals to move and launder money and take cash across borders undetected. Euro banknotes have seven different denominations: 5, 10, 20, 50, 100, 200, and 500. They are legal tender in the 16 European countries that use the euro. The United Kingdom does not use the euro.